So I was in my old stomping grounds of Raleigh, NC this past weekend and saw that there was a LEGO Store in the Crabtree Valley Mall, and decided to stop in. As I had a $5 VIP credit burning a virtual hole in my wallet, I decided to fill a tall PaB cup and use the $5 off to reduce the price to $10.76 after tax. 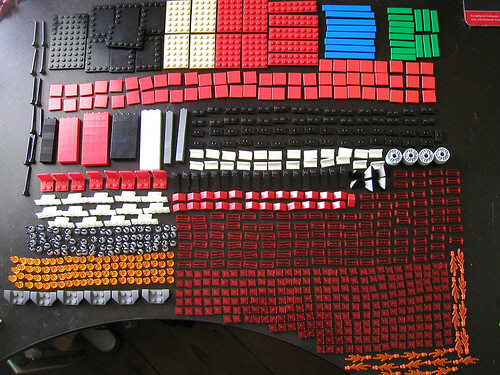 Well, I inventoried the parts I got today, and it turns out I had 1261 pieces in there! 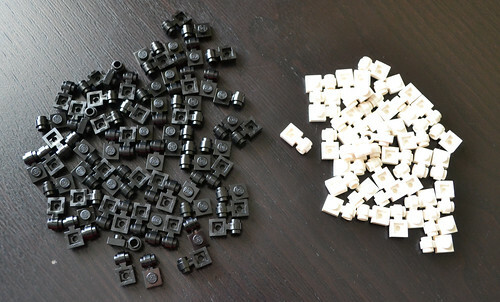 Yes, that's almost 200 more pieces than cents I spent! basically each piece came out to .86 cent! 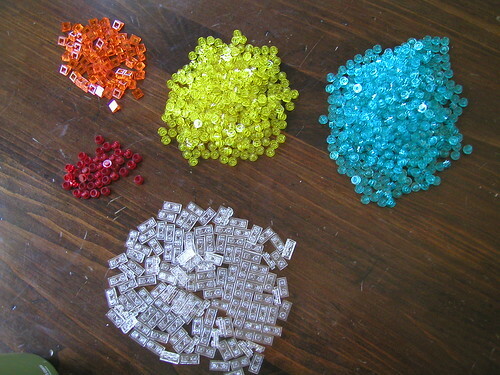 Granted, most of it is small pieces, but still - you'd spend between 5 to 25 cents for the pieces I got. 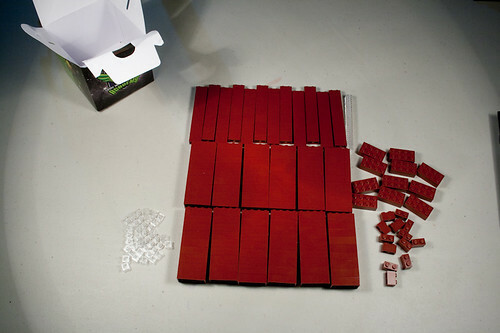 For example, I got 244 1x1 transparent red tiles, which are $0.09 at the PaB page on the S@H website, but I got them for $0.0086 each! Without the $5 credit, they're still just above $0.01/piece, so compared to S@H or briclink, it's a STEAL of a deal. Granted, you are subject to what they have available to you as opposed to having free reign pick, but there's plenty of useful pieces. 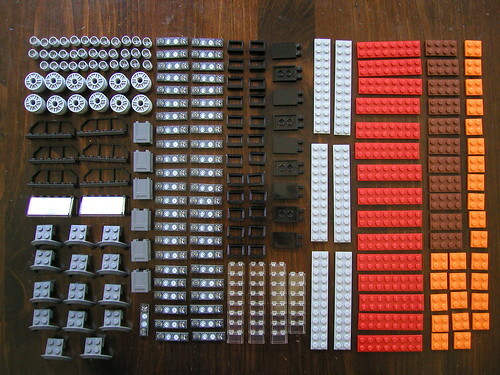 Check out what I got in my Pick a Brick Inventory set at Flickr. Just to whet your appetite, here's a pic of the bulk of what was in the cup. This wasn't everything, though, as I didn't have enough room on my desk to spread them all out! Click on it to go to the pic in the stream - I notated each piece with the type, color and quantity. The next pic in the set is the rest, which was comprised of 1x1 cheese slopes and 1x1 round plates. There are also tips on how to maximize your fill in the notes on other pics. Re: Pick a Brick is actually a good deal! Pick a Brick can have fantastic deals, whenever they happen to have bins full of normally-expensive pieces. In the past I've loaded up when they had clear panels, dogs, leaves, trees, tiles. They know me as the jerk who sticks all his bricks and plates together to pack the cup extra tight. Lately, my store in Sacramento has had a long dry spell of little more than 2x4 bricks. Last time, I did fill up on those levers you got though. Yeah, I steered clear of the 2-bys and mainly loaded up on small stuff, as you can see. The plates worked out well stuck together the way I did it, with the small stuff filling in the gaps. I layered it, basically, with one big chunk of something, then sprinkle little stuff, then another big chunk, rinse, repeat. Haha I too had a discovery like this! The $15 cup is very well known to me. This is why I'm sad the nearest LEGO store is an hour and a half away! I didn't know you could keep one big element outside the cup, thanks for that tip...not to mention sticking the bricks together. Hope you enjoyed your return to NC, we've had some pretty decent weather down here this year. possum wrote: I didn't know you could keep one big element outside the cup, thanks for that tip...not to mention sticking the bricks together. Hope you enjoyed your return to NC, we've had some pretty decent weather down here this year. There's no mention of being able to keep one big element at the store I went to in Bellevue, WA. Maybe that's specific to each location. Plus the two times I went there I didn't see any decent parts just lots of bricks. Don't forget to save your cup and bring it back to refill for a discount. 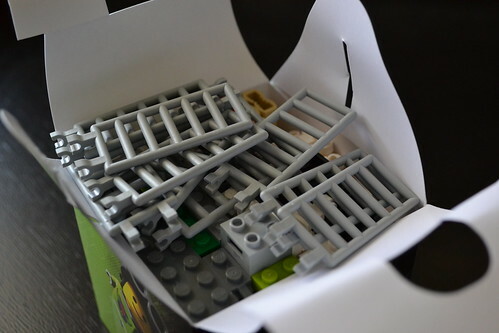 In the long run that $.50 will matter : ) Until then you have some nice storage containers for your LEGO. So far I haven't used the PAB wall, but my soon-to-be stepdaughters love it. I taped the coupon to their cups & they really enjoy getting the variety. As I think more about microscale MOCs, though, the cup could be a really good deal if filled with small pieces. I'll have to ask here in Charlotte about the big piece outside the cup, they have had medium sized plates here at times. beethead wrote: There's no mention of being able to keep one big element at the store I went to in Bellevue, WA. Maybe that's specific to each location. I have a feeling it was only mentioned to me the first time because it was my daughter filling it up. They had the monorail track stands and I wanted one to put the Midi-Scale Millenium Falcon on. I asked one of the associates there "How does this work?" and he said "Just pick a cup and fill it with pieces from the wall." When he noticed I had one of the track stands in my hand he said "We allow you to keep one large piece outside the cup". This past time at Raleigh, I just kept the large plate out and asked at the check-out to double-check and the lady behind the counter just nodded, so it seems to be a pretty standard procedure, just not something they broadcast. Plus the two times I went there I didn't see any decent parts just lots of bricks. Yeah, that can happen. 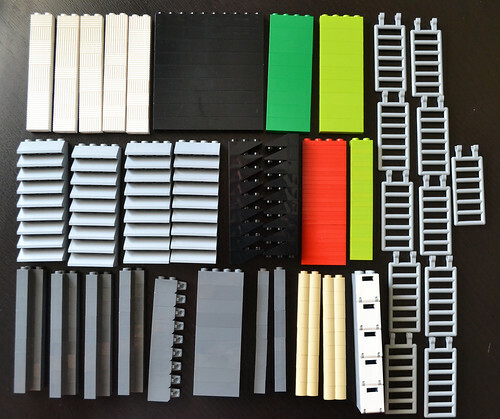 There's a site that gets user-submitted inventories of the PaB walls - not all stores are listed, so you can email the admin to add your store, then download/print their spreadsheet to inventory your store's wall. Forgot to post this, but I got an even better deal using $10 VIP credit and $0.50 cup re-use at the NYC flagship store on their grand opening day: 1319 pieces for $4.89! I had no clue there was one in Cincinnati and I had literally walked by it at one point....doh. on the other hand it means I don't have to pay sales tax on S@H orders. Whoa, I hear ya there. My brother lives in Columbus, but have yet to get down there to LEGO store mainly for reason stated above. You just need to know what element you already have zillions of. 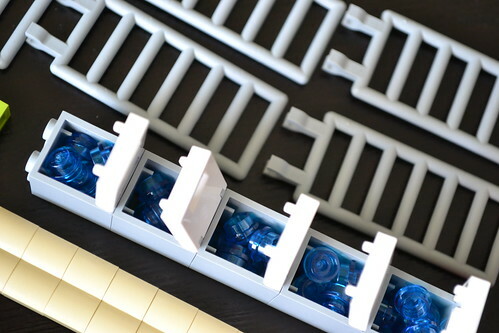 The lids do actually snap on tight if you work with them, so the cups are useful for storage of long elements in your Lego work area. Best deal is VIP credit plus the 10% off you can get if you have a Legoland annual pass or (in the case of my wife and me) a lifetime membership. If you have a Lego store in your area, you need to check it out at least once a month to see if anything new has showed up in the bins. Stores often get surplus boxes of parts made for new sets. Also check out grab bags very carefully, as sometimes you'll get great sets from "recycled" store displays, like a complete speed boat from the Indy series, or the Falling Waters tile from the Frank Lloyd Wright series. Got my PaB box today. Took advantage of the dark red appearing in PaB walls now. 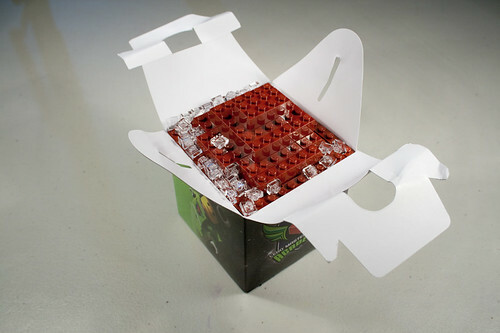 The box interior measures 11 studs x 11 studs x 9 bricks high. Not sure if that's what the holiday season boxes measure or not. Probably could have got more plates and 1x2s, but the store was about to close and I had already spent a bunch of time stacking. Sounds like the same dimensions as the Holiday boxes - I distinctly remember the 11x11 dimension, and the 9 high sounds about right. A tip for packing these, don't try to build one solid block... just build columns of bricks of the same size and stack them next to each other. This can be done relatively quickly. meyerc13 wrote: Sounds like the same dimensions as the Holiday boxes - I distinctly remember the 11x11 dimension, and the 9 high sounds about right. Right, this is what I did as well.